Kuala Lumpur: The impact from the real property gains tax (RPGT) hike, a move to curb speculation in the property market, will be gradual. 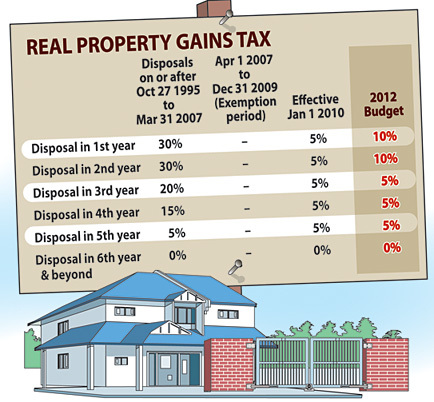 RPGT is a tax on properties sold less than five years after they are bought. Only the profit from the sale of a property is subject to RPGT. It has been doubled to 10 per cent for the first two years and will remain at the previous level of 5 per cent in the third, fourth and fifth year. There will be no tax on gains after the fifth year. RPGT exemption on a residential property is given to both husband and wife on one residential property each, once in a lifetime. Yesterday, Prime Minister Datuk Seri Najib Razak in his 2012 Budget speech said that the existing rate of 5 per cent is not effective in curbing speculative activities and could jeopardise the ability of the low- and middle-income groups to buy houses. These changes, he said, are low enough not to affect genuine property owners and will curb speculative activities. Chairman of the Property Management, Valuation and Estate Agency Division of the Royal Institution of Surveyors Malaysia Adzman Shah Mohd Ariffin said that the move will deter future sales of property within two years of purchase. With prices stabilising and should they sell fast, they will not be able to make a killing. "But, for those who bought a property three years ago, the price appreciation would have been much higher than the 10 per cent RPGT imposed," Adzman said, adding that this category of buyers will continue to make a profit. According to him, properties can appreciate by 20 per cent or more once completed. Real Estate and Housing Developers' Association Malaysia president Datuk Seri Michael Yam welcomed the move. "The fact that there is no drastic change to the ruling on RPGT encourages long-term ownership of property which also helps the owner with capital appreciation and wealth creation as they will hold on to the property longer," said Yam. He added that the first two years are effectively a 100 per cent increase, thus it will help discourage short-term speculation. "It is a gentle/soft landing which will avoid a dip in the supply and demand of property," Yam told Business Times. "The increase in this instance is not unreasonable, given that there are no speculative activities in the entire country but only confined to pockets of urban areas like Kuala Lumpur and Penang. These pockets of activities are insignificant compared with the total supply and demand for housing in Malaysia," he added. However, real estate agent Rahim & Co's managing director Robert Ang said the 10 per cent increase is not an effective measure to try and curb speculation activities. "If you want to curb speculation, why not something higher?" he said. OPPORTUNITY may present itself for house buyers looking for properties in the secondary market especially in prime areas, with the property market going through a soft patch, dampening sentiments of speculators. “We have not detected any downward trend in prices yet, in fact prices are still on an upward trend. However, sentiment may have been dampened by the anticipation of measures that the Government may take to curb speculative buying on properties,” property valuer, KGV-Lambert Smith Hampton (M) Sdn Bhd director Anthony Chua tells StarBizWeek. He notes that the property sector has already seen a downturn in 2008, triggered by the United States subprime mortgage crisis following the 10-year cyclical nature of the global economy. He, however, says house prices in Malaysia were not impacted extensively at that time. “I would be more inclined to say that prices appreciation in the near future would be moderate. However, I think there will be a technical correction by next year. If you read the signs now, there might be a correction coming soon,” he said. “Its about time for a correction. Hopefully we will not experience a drastic correction this time as sales data of new properties built by prominent developers are still enjoying brisk sales. The demand for houses and the savings of people are still there,” he says. Chua says property prices in the secondary market is still stable especially in established areas and mature townships like Petaling Jaya, while properties outside the vicinity of Klang Valley have not seen any significant uptrend in price, excluding prominent locations like Bukit Tinggi and Penang. Speculation is rife that the authorities may end the stiff competition seen among banks by maintaining a certain margin for banks, putting a stop to interest-rate slashing by banks to attract more customers for their banking loans. A local research-house analyst says that although this may be beneficial for banks, ultimately it would squeeze the pockets of consumers in the interest of banks. He adds that Bank Negara was also keeping a close eye on mortgage loans to see whether a cap on the loan to value ratio (LVR) for second mortgages is necessary. “Any raise in the LVR would further dampen demand for properties, and right now its exceptionally hard to predict what the authorities are going to do next to further regulate the property market, as these speculated actions are all double-edged swords that the authorities need to carefully play around with,” he says. Meanwhile, Henry Butcher Malaysia Sdn Bhd chief operating officer Tang Chee Meng expects property prices to hold firm for the next six months but that all depends on how external factors like the eurozone crisis and the faltering US economy will fare in the near term. “The market has softened a bit with demand weakening since April, and it would be an additional concern for the property market if loans are given based on an individual's net income compared with the currently used gross income standard,” he says. “People are just concerned and everyone is adopting the wait and see stance before acting. Buyers are more cautious and selective to make sure that the properties they buy are priced reasonably,” he says. 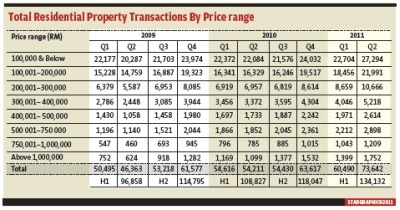 According to data provided by the National Property Information Centre, the country recorded more than 134,000 transactions in the residential property sector during the first half of 2011, an increase from 108,000 transactions recorded in the previous corresponding quarter. More than 929,000 property transactions worth RM253.19bil were recorded in the market from 2009 till now, including 214,000 transactions worth RM64.75bil for the first half of the year. Recently, research houses have also started to downgrade the property market, with the most recent being RHB Research which says that the positive catalysts for the sector is scarce. It expects the property market to continue underperforming the broad market with the weakening ringgit and lower expected returns from properties, coupled with a less bullish sales target next year as the research house sees further downside risk to gross domestic product growth. “On the physical market, although foreign buyer content in the Malaysian property sector is small, the weakening ringgit does suggest that the expected return from property investment is getting lower from the foreign perspective. This will diminish the relative attractiveness of Malaysian properties to foreigners,” it says. It says more bargaining opportunities can be found in other countries such as Hong Kong and Singapore as property prices have start to retrace. PETALING JAYA: Dijaya Corp Bhd has acquired a one-acre freehold land along Jalan Sultan Ismail, Kuala Lumpur, for RM65.25mil. In a filing with Bursa Malaysia, Dijaya said the land was acquired by its 99.99%-owned subsidiary Ace Rhythm Sdn Bhd and would be turned into a mixed development, consisting of serviced apartments and commercial lots. “With this acquisition, Ace Rhythm is expected to generate an estimated gross development value of RM650mil from its projects, thus contributing positively to the group's future revenue stream and financial performance,” it said. Imagine stepping into the shoes of a city planner. If given the opportunity, how would you accommodate 150,000 families on an island of 10,000 acres which is fully covered with primary rainforest? Perhaps the first thing that comes to your mind is a proper plan to house the 150,000 families and at the same time, build enough infrastructure and facilities to make the island a lovely place to live in. Let's dwell further and imagine two extreme options available. The first option is to accommodate all 150,000 families in terrace houses at a tight 15 units per acre. This basically means the entire rainforest in the island needs to be chopped down to give way to 150,000 homes. As the houses are spread all across the island, there will be a need to build extensive network of roads to connect them. Obviously, this would use up more land, creating traffic jams and leading to an inefficient public transportation system. The second option is to accommodate all the families in a higher density development or vertical development by developing an average of 100 units per acre. With this option, 1,500 acres of the island will be covered with 150,000 high rise homes, leaving 8,500 acres of primary rainforest untouched. With such a huge land reserve, you can turn some of the land into recreational parks and public amenities where dwellers can enjoy and lead healthier lifestyles. In addition, commercial centres built within residential vicinities would be able to enjoy greater business opportunities and economies of scale brought in by the high density development. Even if you took an additional 500 acres from this, it would still leave you with 8,000 acres of rainforest. The two scenarios above do resemble a real life situation. So, as a city planner, what would be your choice and how would you plan your city? As the population continues to rise and land for development becomes scarce, growing a city vertically as opposed to horizontally makes more sense since more housing units and facilities can be built using less land. The efficiency of vertical developments allows more land to be preserved for future usage, which will become precious resources for the future generations. In a vertical development, it is common to have facilities which are not viable in a horizontal development. These include swimming pools, sport centres and landscaped and recreational areas. These facilities create an ideal living environment for residents to enjoy a more balanced lifestyle as their homes are not just confined to the size of their units, but extend to all facilities in the common areas. People who stay in high rise developments can also utilise a combination of vertical (lifts) and horizontal (MRT, buses and taxis) facilities and transportation to move from one place to another. There will be fewer roads and cars as more people take public transportation, which are more cost effective, efficient and environmentally friendly due to increased densities. From an architectural point of view, vertical development does not only improve the quality of life, but also contributes to the attractiveness of a city as high rise buildings do create interesting landscapes. Hong Kong, which is known as the “Pearl of the Orient”, is one of the best examples of a city formed by skyscrapers. The beautiful composition of Hong Kong happens naturally as the city grows. Singapore also has a very successful lineup of skyscrapers, efficient mass transit system and green resources in the heart of the island. Last year, at the WCSC 2010 (World Class Sustainable Cities) Conference organised by REHDA KL, MIP & PAM, the city of Curitiba, Brazil was featured. This has to be one of the benchmarks for sustainable cities. What is amazing is that the transformation has only taken place in the last 40 years. Today, skyscrapers line the city on either side of dedicated bus only highways, pushing up public transport ridership to a phenomenal 80% to 90%! In the meantime, residents enjoy around 50 square metre of greenery and parkland, more than double the global average and more than three times the KL average. I have encountered many foreign visitors who tell me that KL is a beautiful city. This is because our capital city is located in a valley where the land is not flat, and there are many tall buildings with different heights forming an appealing city skyline. Besides, suburbs such as Bangsar and Mont'Kiara which house plenty of high-rise developments have also became attractive residential areas for the local and international community due to the interesting skyline. If a city solely focused on horizontal developments, it would end up with a dull and flat skyline. All you can see are rooftops if you were to look down from high altitude. Many years ago, a prominent national architect voiced out that low density developments contribute to “future slums”. He believed that houses could not last forever perhaps 50 years and they would be demolished to make way for tall buildings. If we focussed on landed property development, the pace of development may not be as fast as the nation aspires it to be as there are too many individual owners to coordinate with in terms a new development plan. Now, imagine you are one of the 150,000 families mentioned. Which would you prefer? Occupy a terrace house in cramped streets, facing limitations in terms of daily activities and future growth of your country, or opt for a high rise building with efficient traffic-free public transportation and ample parks in order to enjoy a more efficient and balanced lifestyle? Datuk Alan Tong is the group chairman of Bukit Kiara Properties. He was the FIABCI world president in 2005-2006 and was recently named Property Man of The Year 2010 by FIABCI Malaysia. The Government has extended the concessionary tax rate of 10% on dividends of non-corporate institutional and individual investors in real estate investment trusts (REITS). The incentive, which expires on Dec 31, will be extended for five years, starting from Jan 1 next year to Dec 31, 2016. “We are very happy with the extension as there was a lack of clarity on what would happen after the expiry,'' said Malaysian REIT Managers Association (MRMA) and Axis-REIT Managers Bhd CEO Stewart LaBrooy. Mah Sing Group Bhd managing director Tan Sri Leong Hoy Kum said this would promote domestic participation and attract foreign investors. Labrooy added that the REIT industry had developed very well over the last few years. The upcoming REIT to watch out is that of Pavilion Kuala Lumpur which should add further liquidity to the market. Pavilion Kuala Lumpur is slated to be Malaysia's largest initial public offering for a REIT. It is likely to be valued at a yield of 7%. Details are still sketchy at this point, but sources said its assets could be worth between RM4bil and RM5bil. Meanwhile, individual and institutional investors in Singapore and Hong Kong do not pay withholding tax on their REIT investments. Both local and foreign retail as well as institutional investors in Malaysia now have to pay a 10% withholding tax, which had already been reduced from the 25% tax rate previously. The withholding tax rate in Malaysia has not been adjusted since 2008. I visited South Korea recently in connection with a valuer (called appraiser there) meeting and although this was not my first visit, I was nonetheless impressed with the generally high level of efficiency in the country. Hassel free, from the well organised public transport, to the high service levels in the hotel and retail sectors. The smooth and efficient bullet train ride from Seoul to Gyeongju, covering about 400 kilometres in two and a half hours was also impressive. Not so efficient, in my opinion however, is the housing market in Seoul. Possibly a bubble that will burst, if it does not deflate quietly (which is unlikely), or one that risks growing bigger and then bursting or deflating. Astute policy nudging and/or more in-depth, knowledge-based decision making by market participants are key to a smooth “landing”. Greater Seoul has 20 million inhabitants and that is 40% of the population of the country, a rather high percentage for a capital city. The Korean Peninsula is mountainous. The per capita GDP of the country is about RM60,000 (based on a conversion of 1:3) as compared with Malaysia's, which is about RM21,000. The average monthly household income in Seoul is RM12,000. In Greater Kuala Lumpur it is about RM6,000. The average house price in Seoul is about RM1.4mil and this means that on average the house price is close to 10 times household income, and this is viewed with some consternation by Koreans. About 10 years ago the average house price was 6 times household income, also slightly elevated as measured based on a global long term benchmark for developed countries at three times. Kuala Lumpur typically has house prices at a long term relationship of around 4 to 4.5 times annual household income, but in many hot spots, in the past few years, there has been a run up to more than 10 to 15 times when viewed from an average household. And it may surprise many, that despite frequent comparisons with high-end condominiums in Singapore, HDB flats in Singapore, that house the majority of households in Singapore, the relationship is only about three times. Japan which neighbours Korea had a property bubble in the late 1980's and prices soared to close to 20 times annual household income, only to come down crashing, and 20 years later, most of the medium sized cities in Japan have a corrected and stable relationship of about five to six times but with the Tokyo suburbs closer to 10 times. Net yields, the second driving fundamental in the housing market, in Seoul are nothing much to speak about, being about 2% per annum. In Kuala Lumpur yields have slipped below the 3% benchmark for the ubiquitous double story terrace house. This figure of 3%, in the hierarchy of property yields, is generally acceptable when capital appreciation possibilities are a possibility but when such possibilities dim then a higher return should be the order of the day. My Valuer friends in Seoul opine that much has to do with “Chonsei” system in Korea that has led to the high house prices in Seoul, apart from a long, inordinate support for the construction industry that has now resulted in construction being a high 20% of GDP, and the other usual culprits of easy money and exceptionally low interest rates. This system of owning houses for owner occupation and investment is predicated on rising house prices. Landlords, for example, rent out houses by getting the tenant to set aside in a finance company or bank a lump sum for rent over two years and take the interest as rent. Interest, which in the past, and due to artificial constructs was high, has come down as the economy irons out these constructs as it modernises further. The landlords in the past were happy with this because their focus was on capital appreciation, which was sustained and high. But of late, especially since the middle of the last decade, house prices have stopped rising. The market is now normalising and rents that drive values are taking hold and tying values to more normal returns. The process will continue further as the Koreans move inexorably towards a market where house prices are tied to household incomes and driven by rental returns. The housing market in any modern economy is an important pillar. It is a store of household wealth and when it stalls or falls it has an impact, sometimes an outsized impact, on the economy. In the United States, house prices went up (and was allowed to go up by design or mistaken notions) against governing fundamentals and are now on a downward trajectory to the detriment of the economy at large and the global economy. A recent article in the Wall Street Journal shows the pre-bubble average house price increase from 1988 to 2000 to be 3.6% per annum and it shot up to 10.4% per annum between 2000 and 2007, outstripping average household income increase. The US Bureau recently revealed that median household income in the United States in 2010 fell to US$49,445, the lowest in more than a decade. In Malaysia, our country-wide compounded annual average house-price increase in the period 2000 to 2009 was about 5%, running neck to neck with household-income increases. Regulators are obliged to cast a watchful eye on the housing market and know the driving fundamentals, and where and when needed, nudge the market through astute policy intervention. Post 2008 Global Financial Crisis, most countries in the region, including ours, have taken policy measures targeted at the housing market as against mainly broad brush monetary policy measures of the past, to stamp out excessive speculation and keep the market tied or running not too far from underlying fundamentals. This no doubt requires constant monitoring of the market, and in particular, before and after any policy implementation. On a broader perspective, the market should be allowed to function as a free market and any intervention kept to a minimum and only to iron out free market imperfections. Elvin Fernandez believes in the free market and timely nudging by policy makers and key market participants to iron out any, and only where needed, imperfections in the system.